In his first novel, The Summer Between, author Andrew Binks has written a beautiful and moving story of a boy poised on the cusp of adolescence. Set in an eastern Ontario rural community north of Ottawa on the shores of the Ottawa River during the late 1960s, the story is told through the eyes of twelve-year old Dougaldo (Douglas) Montmigny who is of Anglo and French descent and lives with his family year-round in the cottage community of Baird’s Landing. Dougaldo inhabits a narrow world that is at times stiflingly oppressive. The period in which this story takes place is a time of great social and political evolution for Canada, a young country coming into its own. However, like many rural communities Baird’s Landing selfishly holds on to its insularity in an attempt to keep the changing outside world at bay. A disdain of differences, racism, homophobia and religious fervour are endemic among many of its residents, both young and old, and what Dougaldo witnesses and experiences is often confusing, hurtful and alienating. For centuries a life source for the Algonquin nation and later for European settlers and a natural border between English and French Canada, in many respects the river serves as an emotional lifeline for Dougaldo, who seeks escape from a difficult family life by focusing on the more boyish pursuits of swimming and fishing. Most of all, Dougaldo anxiously awaits the coming of summer and with it the arrival to the Landing of his friend Tomahawk (Tom) Clark, a Métis boy of Ojibway and Anglo ancestry. In The Summer Between Mr. Binks pays tribute to the land and peoples of this region through his superbly crafted narrative that captures the beauty and majesty of the land and the essence of the history, collision and mixing of cultures and languages. Most striking is the author’s writing of the narrative voice of Dougaldo and more broadly the dialogue throughout the book, which authentically captures the unique manner of the vernacular language and idiomatic expression of the characters owing to the reciprocal influences of the English and French languages. All of this serves as a rich backdrop to Dougaldo’s story and the world as seen and told through his eyes. Dougaldo’s quest throughout the book is to become close with Tom and to “make blood brothers with him.” His internal voice tells him that he is different from other boys and with a growing sense that the nature of his feelings for Tom may be of more than friendship. Mr. Binks has written Dougaldo in such a way that his purity of spirit and honesty shine through rendering this character’s narrative voice one that is most precious and the character himself unforgettable. It is a voice that is both untouched and innocent and at the same time hauntingly perceptive and wise. Dougaldo tries to make sense of all going on around him, of his parents’ turbulent marriage, of the tensions between English and French, and of the prejudice against Indians, all the while trying to reconcile his feelings of love and desire for Tom and the growing knowledge that what he feels is looked upon as being wrong. In addition to the exceptional characterisation of Dougaldo, the secondary characters in this story come alive through Dougaldo’s rich perspective and the dialogue throughout the novel providing a genuine portrayal of the people of this community. While Mr. Binks excels in the characterisation of both recurring and occasional secondary characters, it is his portrayal of Tomahawk that stands out most. Tomahawk is aloof and somewhat enigmatic, and with the exception of the time that he spends with Dougaldo, he seldom participates in community life. While the mystery of Tom serves to heighten Dougaldo’s quest to become ever closer to him, the sense that he is separate and disconnected from the community deftly captures the marginalisation that Tomahawk, as part First Nation, would have likely endured in this place and during this time. 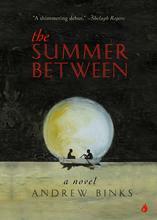 The Summer Between is a poignant and introspective novel that is at times both funny and heartbreaking and that seamlessly fuses universal themes of a boy’s experiences as he embarks upon adolescence with the growing realisation that he is different against the backdrop of the local colour of rural eastern Ontario in the late 1960s. In this respect, Mr. Binks offers the reader an incredibly thoughtful, thought-provoking and bittersweet story of a boy coming of age and at the same time a distinct slice of period Canadiana. By all accounts The Summer Between is an exceptionally written novel that should not to be missed. The Summer Between by Andrew Binks is available at Harbour Publishing, Indigo-Chapters and Amazon Canada and US. This entry was posted in Fiction, Indie Reviews, LGBTQ, Literature, Three Dollar Bill Reviews, Young Adult and tagged Andrew Binks, Nightwood Editions (Harbour Publishing) by Indie Reviews. Bookmark the permalink.